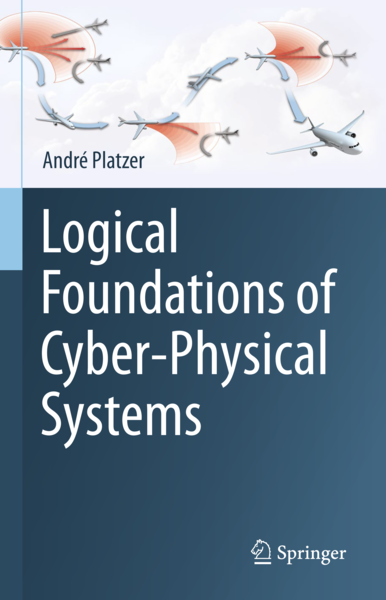 Textbook on Logical Foundations of Cyber-Physical Systems. Springer, 2018. After starting KeYmaera X, usage information can be obtained from the Help menu on the top right. The first thing you want to do is select your favorite arithmetic solver from the menu Help->Backend Tool Configuration. At present, the support for Mathematica provides more functionality than that of Z3 which ships with KeYmaera X. Quick usage help: display help with the ? menu button on each page. Models page: displays your CPS models. Importing models from tutorials or load your own models. Choose an action to show or start proofs for a specific model, generate monitors or tests. Proofs page: displays all CPS proofs that you've started. Choose an action to open or download a proof. Tactics are used extensively in the implementation of KeYmaera X. One way to learn how KeYmaera X tactics work is to observe how KeYmaera X automatically generates a tactic for you as you interact with a proof. To demonstrate some of the functionalities of tactics, custom tactics are also included for the tutorial models. Open the Models page in the menu. Click on Browse in the tactics column for one of the models. These examples are also provable directly with much simpler tactics or fully automatically. But the custom tactics demonstrate different features and give a good idea on the structure of the resulting proof. KeYmaera X was designed to achieve powerful automation of hybrid systems theorem proving while ensuring soundness. 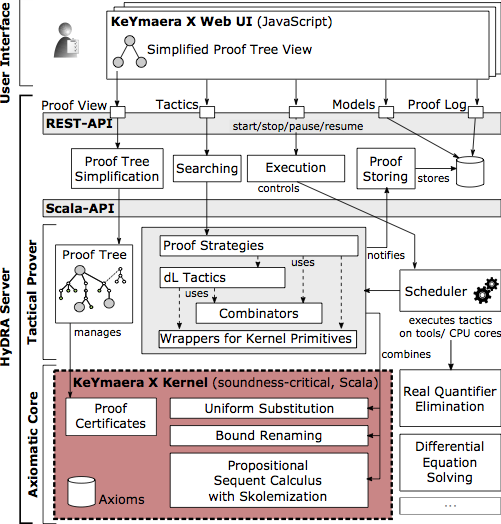 The architecture of KeYmaera X is separated into a small, soundness-critical kernel and an extensive tactic framework to regain and exceed the convenience of powerful proof rules. KeYmaera X is powered by multidynamics technology. The differential dynamic logic [2,9] and proof calculus that KeYmaera X implements are described in detail [13,18]. The KeYmaera X theorem prover itself is described in a tool paper  and its tactics language Bellerophon at ITP . A tutorial on the modeling language that KeYmaera X uses can be found in STTT . A tutorial on differential dynamic logic and its proof principles appeared at LICS . A comprehensive introduction into the core principles of cyber-physical systems, including their modeling and proving principles can be found in a textbook .